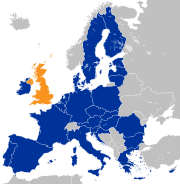 Art 50 (3) of the Treaty of European Union requires the treaties upon which the European Union is founded and their legal superstructure to cease to apply to the UK from the date of the withdrawal agreement that the remaining member states are required by art 50 (2) to negotiate with the UK or the 29 March 2019, whichever occurs first. A draft of such a withdrawal agreement was published at the end of February and about 80% of its text is said to have been agreed but there are a number of differences to resolve not the least of which is the border between Northern Ireland and the Irish Republic. If those differences cannot be resolved before 29 March 2019 many of the laws under which the UK has done business with its 27 neighbours will disappear. One of the most interesting and in some ways alarming of those documents is the Guidance Banking, insurance and other financial services if there’s no Brexit deal 23 Aug 2018. That document considers the consequences of the loss of passporting rights and acknowledges that at least some British institutions are setting up subsidiaries in the EU to continue their business after Brexit. Anyone wishing to discuss this article or Brexit in general should call me during office hours in +44 (0)20 7404 5252 during normal office hours or send me a message through my contact form.